Lets you give superior care to your feline friend. Provides an all-in-one formula to give your cat the nutritional and immune support he/she needs. Provides an all-in-one formula designed to give your cat the vitamins, minerals, antioxidants, amino acids and protein for health and longevity. Scientifically developed 4Life Transfer Factor animal formulas combine balanced, comprehensive nutrition, including valuable vitamins, minerals and antioxidants with the immune system support of 4Life Transfer Factor Plus® Advanced Formula. 4Life Transfer Factor Feline Complete contains over 40 valuable nutrients, including amino acids, probiotics, essential fatty acids, 4Life Transfer Factor Plus Advanced Formula and the 25 vitamins and minerals considered essential for the optimal health of your cat—all in a great-tasting cheese and whey flavored supplement sure to have your cat meowing for more. In addition, it includes a synergistic blend of glucosamine and chondroitin, designed just for felines, to promote healthy joints and connective tissue. "I give the Feline Complete and Canine Complete formulas to my cat and my dog. I’ve noticed that they both look more vibrant and bright and their eyes are more alert. It’s a subtle change but I can definitely notice it in them." 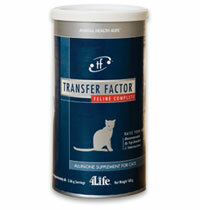 "Our cats have thrived on 4Life Transfer Factor and Transfer Factor Feline Complete. This complete formula has helped provide total support for their bodies. Our younger cat loves her Transfer Factor so much that if I forget to add it to her food, she lets me know about it!"